Oats Idli is a steamed cake made of oats and semolina. 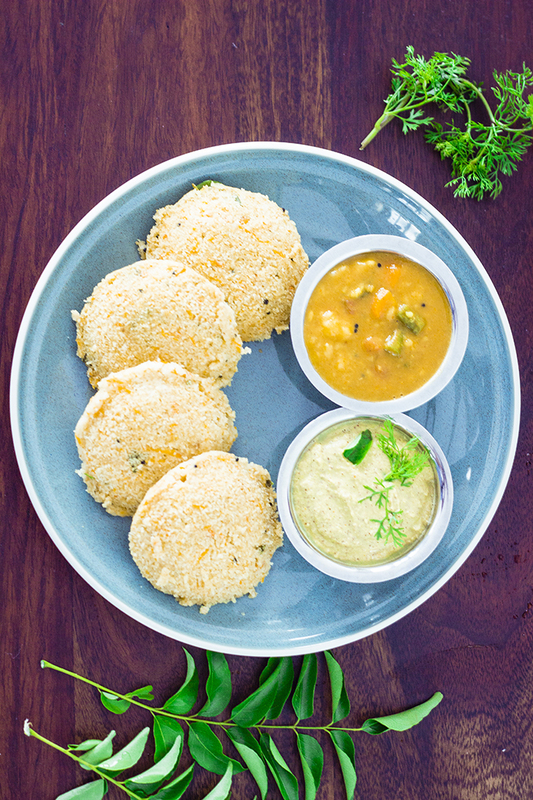 It is a healthy take on the popular South Indian breakfast of rice idli. So what have you guys been up to? I know I missed posting last week, but I won't make any excuses. I'm just happy I managed to get a post this week. But in between we got a lot of new additions to the house. In came some mango wood wall shelves that helped us drag out all our travel memoirs. I'm so happy I now get to display all the souvenirs we've collected over the years. If you've missed reading about our recent travels, you can now read them here. We also finally got a dining table!!! Since we never ate at the table, I never missed having one. But now that I have one, I love it. We had so many discussions and measurements until we finalized on a teak rectangle four seater. I cannot believe we contradicted each other on pretty much everything about the table - the size, the color, the shape. I wonder how we ever buy anything!! Now all I have to ensure is that the table is clutter free. Straying back to our recipe of the day - Oats Idli. 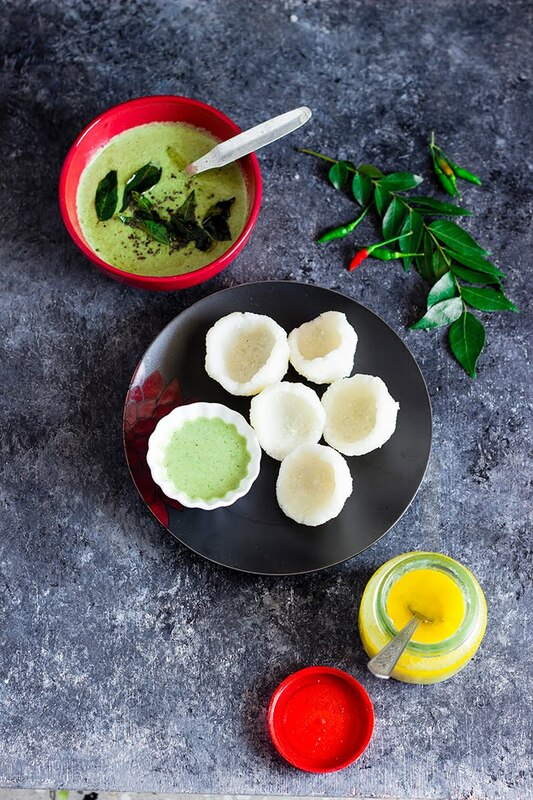 If you've ever been around a South Indian, you have to know how much we love our idlis. Idlis are light fluffy steamed rice cakes made by steaming a batter made from fermenting ground rice and black lentils. While that is healthy too, I now have a healthier version for you, and on the plus side, a quicker version too. Raise your hand if you hate oats but still want to include them in your diet for all the health benefits it gives you. That is exactly what inspired me to make these idlis. Raj hates oats, he'll only eat them if he doesn't know it is in the dish. So these oat idlis were the perfect place to hide them. These idlis are made with oats and semolina (cream of wheat) instead of the rice and lentils. Sour yogurt or curd is used to give it the slightly fermented taste. To make the idlis light and fluffy, I used Fruit Salt or Eno. 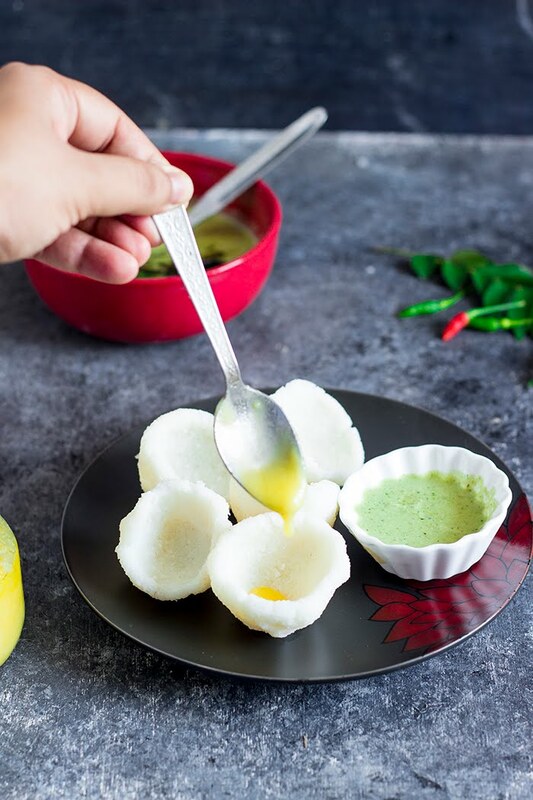 To ensure that you don't end up with hard idlis, always have the steamer hot and ready for steaming before adding in the fruit salt to the batter. Once you add the fruit salt, don't over mix, just make sure it is combined and add it to the plate or bowl you want to steam the idlis in. While I used rolled oats this time, I have made it in the past with oat meal too. 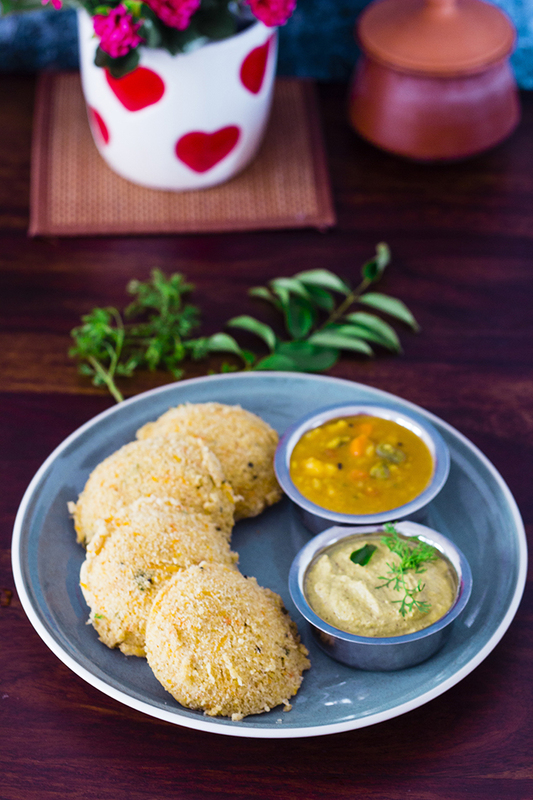 Use either one of them to get the same results - Soft fluffy healthy Oats idlis. 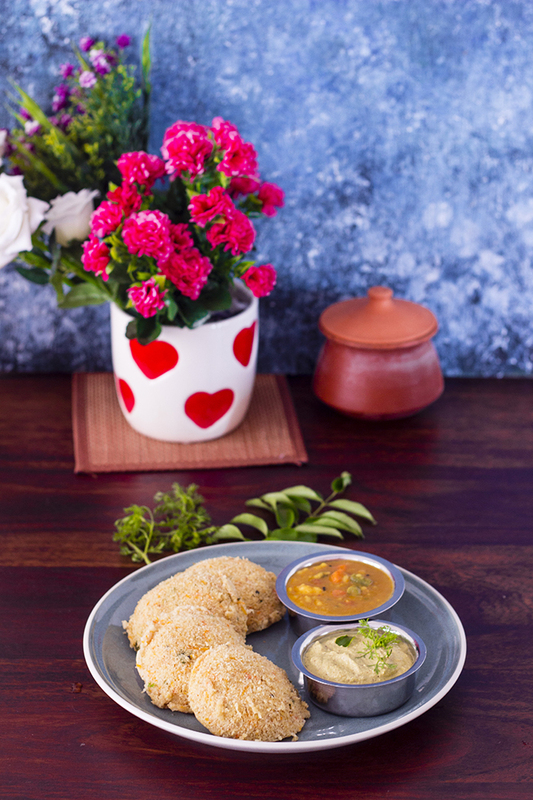 Serve them with traditional coconut chutney and piping hot sambar for best results. Oats idli is a steamed cake made from oats and semolina. It is a healthier version of the popular south Indian breakfast of rice idli. This is an instant recipe and does not require any fermenting. 1. Powder the oats until smooth. 2. Heat 1 Tbsp oil in a pan and add mustard seeds. 3. Once they splutter, add in chopped curry leaves and chana dal. Saute for 30-45 seconds. 4. Add in split cashew nuts and fry until the cashews brown slightly. 5. Add the semolina and saute for 4-5 minutes until the semolina is fragrant. 6. Add in the powdered oats and fry for 2-3 minutes. 7. Remove from heat and allow to cool completely. 8. Add grated carrot, chopped coriander leaves, salt and whisked yogurt to the dry ingredients. 9. Mix well and keep aside for 10-15 minutes. If the batter feels very dry, add a little water. The consistency of the batter is slightly thicker than usual idli batter. 10. Heat up the steamer and grease the idli plate or small bowls. 11. Add the fruit salt and a little water and mix well until combined. 12. Pour spoonful of batter onto the greased idli plate or bowls. 13. Steam for 10-12 minutes. 14. Demould and serve hot with chutney or sambhar. 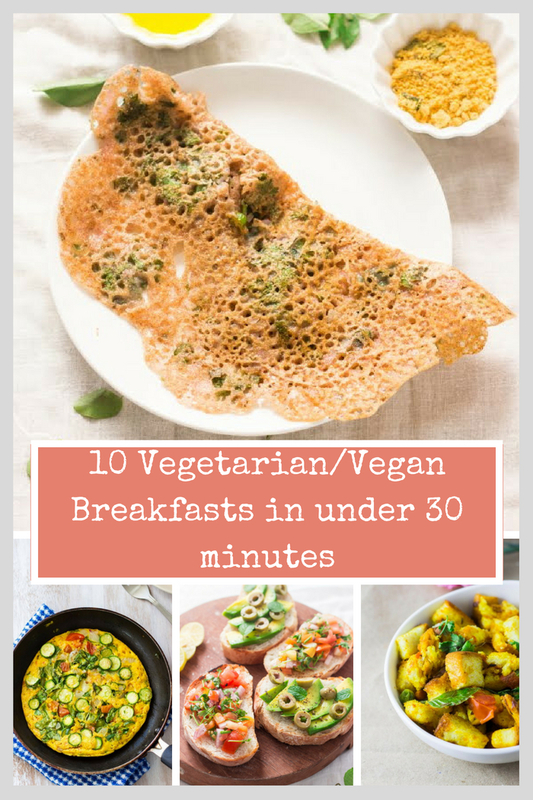 A compilation of ten easy to make vegetarian / vegan breakfasts that can be made in under 30 minutes from scratch! Do you love breakfast? Or are you one of those people who just wants to be done with it cause every scientific article calls it the most important meal of the day? I am definitely the breakfast lover category. If you are in the same category, welcome my friend!! If not, why is it that you would rather skip this meal - crunched for time? not hungry in the morning? don't have good breakfast options? I'm here to solve some of these problems for you through this teeny weeny post. I am also forever crunched for time, you see while I love breakfast, I am not an early riser and most of my morning is spent scrambling to get ready to catch my bus to office. I give myself exactly 60 minutes from wake up to run for bus. Also, I am absolutely against cereal for breakfast, I believe it is just sugar. So it is always a savory breakfast for me. I have hence, compiled a short list of 10 breakfasts that you can make in under 30 minutes for those busy mornings. Also, a few of them can be prepped the previous night or even, prepared the previous night. Just reheat and enjoy in the morning. Churmuri Soosla is a stir fry made from salted puffed rice (not the cereal), onions, tomatoes and turmeric. It is then topped with lime juice and roasted gram powder. This makes for a very good after school snack or evening tea time snack too. My favorite way to use up old bread is to stir fry it with spices, onion and tomato. You can make this bread upma with fresh bread as well. Quick and easy recipe. Omelet always means Eggs, except in this case. Tomato omelet is made from chickpea flour or besan. Add lots of tomato to it and some spices for taste. Pour them onto a hot pan and cook them just like you would cook an omelet. Serve it with bread or eat it just like that, the choice is yours. This one is very similar to the Tomato Omelet above, but this Dosa is made with whole wheat flour or atta instead of chickpea flour. Serve this with some coconut chutney or sambar in pure South Indian style. If you love bread for breakfast, you will love this bruschetta. One is a classic bruschetta with onions and tomatoes while the other is a take on avocado toast with avocados and green olives. My favorite picnic breakfast of all times - bread with one slice smeared with butter and another with a simple coriander-coconut chutney. Use vegan butter to make it vegan or just skip the butter. The chutney can be prepared the previous night if you want to cut down on time in the morning. Make the sandwiches when you plan to eat them to avoid a soggy mess. Frittatas can be vegan too! Try out this vegan frittata made with chickpea flour or besan and baby zucchinis for added health. Load it up with your favorite veggies to make it healthier. This is just a different take on the tomato omelet mentioned above. Here the tart tomatoes are replaced with sweet grated beet roots that add that wonderful pink hue to the pancakes. For a quicker breakfast prep in the morning, grate the beet root the previous night and save time. Instant Ragi Dosa is a very healthy breakfast option as it uses finger millet or ragi flour. Ragi is rich in nutrients and very good for healthy. Ragi flour is mixed with fine semolina or cream of wheat with spices, onions and herbs to make a very runny batter. he only dairy element in there is yogurt to add a little sourness to the dosa, you can either skip it or replace it with vegan yogurt to make this recipe vegan. Again, this is very similar to the Instant Ragi Dosa, but made with rice flour. A popular breakfast in Bangalore, this recipe will teach you how to make it at home with a lot less oil. The only dairy element in there is yogurt to add a little sourness to the dosa, you can either skip it or replace it with vegan yogurt to make this recipe vegan. Rose and Cardamom flavored cake made to celebrate LOVE!! Okay, I know it isn't Valentine's Day yet, but I'm sure you have already started planning something special for your special someone. Right? A lot of people shrug away Valentine's day thinking it is only for those newly crazily in love who can't keep their hands of each other types. But with 10 years of relationship under my belt, I can tell you it does matter even for those who have quietly slipped away into routine. And may be more than the new found lovers. When Raj and I started out, we had so much to talk to each other, we did special things for each other, we strived to remember each other likes and dislikes. Roses were given, chocolates too. Gifts and cards and plushy toys. Now 10 years later, conversation usually revolves around what happened in the day or what is happening around the world. We already know so much about each other, nothing is new. In a strange way that is comforting, but there is a lack of surprise. We don't strive to remember the likes and dislikes, because it is now etched away in the subconscious mind. Gifts have less whimsy and more practicality. A lot of people call it the boring married life, I too sometimes. But there is comfort in this "boredom", in knowing there is someone who cares for you. Someone who will be there for you when you need it. But comfort tends to make one complacent and we miss out appreciating each other as often as we probably should. Hence, days like Valentine's day are required along with anniversaries and birthday, just to celebrate the love you have for each other. So, I made this Persian Love Cake, a while ago just to celebrate love. I thought it was perfect to share right around this time. It is a delicious cake made with almond flour and flavored with middle eastern flavors like cardamom and rose. This is then topped with a citrus syrup and nuts. You can use nuts like pistachios or almonds. Hazelnuts or cashews may be delicious too. I also added saffron to the citrus syrup to give a more orange hue. This cake is one of the simplest I have ever made. No whipping, no creaming. Just mix all the dry ingredients with the wet ingredients. Allow it to rest. Then bake it. Prepare the syrup while the cake bakes. Brush brush brush and top with nuts. It is a simple yet flavorful cake. My family loved it, and I hope yours does too. I substituted half the almonds with semolina considering the cost of almonds. To get a richer and gluten free cake, just use almonds. You can serve this cake with whipped cream or Greek yogurt or your favorite vanilla ice-cream. Or just plain, like I did. P.S. Not all our gifts are practical. 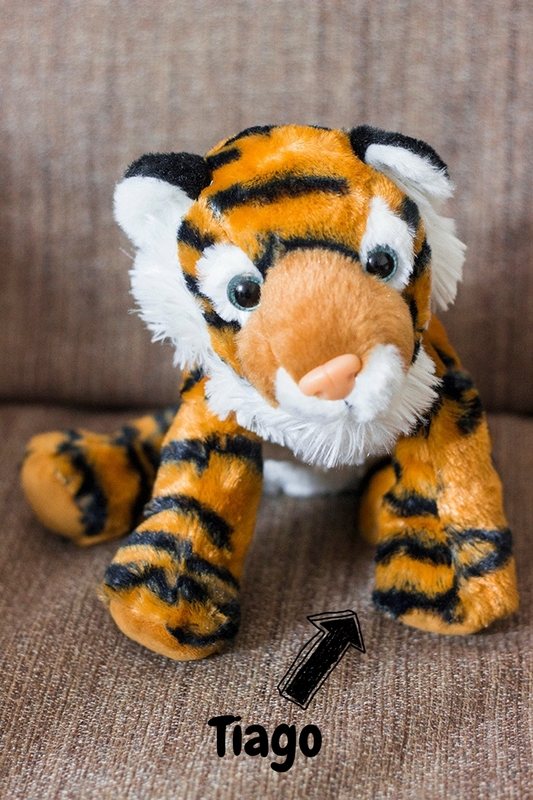 The man got me this little fella from Thailand cause I always wanted a tiger cub!! Isn't he adorable? 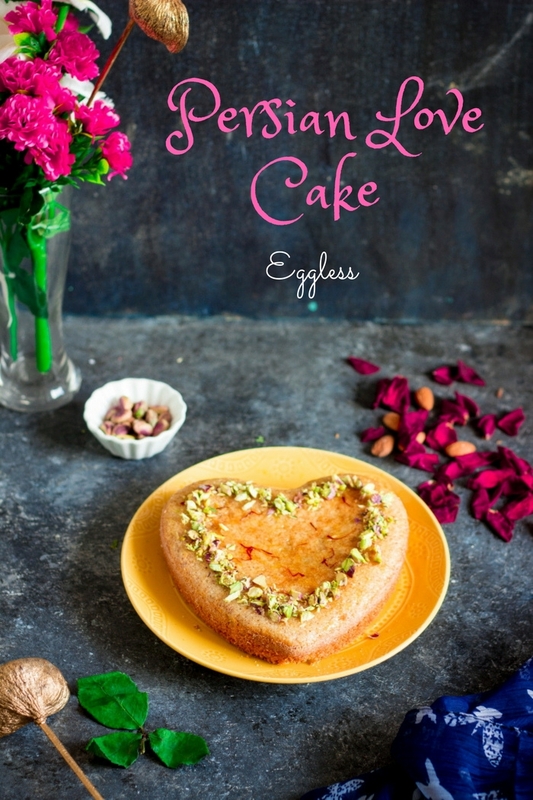 Persian love cake is an eggless rose and cardamom flavored cake made with almond flour and semolina. Brushed with an orange syrup and topped with chopped nuts. Powder the almonds until fine and add to a mixing bowl. Crush the seeds of the cardamom until fine using a mortar and pestle and add to the mixing bowl. Add in the semolina flour along with powdered sugar. In another bowl, whisk oil, yogurt and 2 tbsp rose water until smooth. Add it to the dry ingredients in the mixing bowl. Mix well. Cover and rest for 30 minutes. Preheat the oven to 180 degree Celcius. Add the baking powder and baking soda and mix well. Spray the cake tin with oil or rub oil in it using paper towel or your fingers. Dust it with semolina flour. Pour in the cake batter and bake for 30-40 minutes. Remove from the tin after 2-3 minutes and keep aside. Juice the orange and add it to a pan on the stove. Add the remaining rose water. Add in the sugar and cook until the sugar melts and the syrup thickens. Add saffron strands and allow to infuse for 1-2 minutes. Brush the cake with the syrup. Decorate with chopped pistachios or almonds and serve. Avarekalu Uppit or Upma is a basic South Indian breakfast made by cooking toasted semolina in a vegetable broth containing boiled Avarekalu or Hyacinth beans. Every Indian mother thinks their children should stop cooking "Special" dishes and learn to make the basic mundane daily food. Do you agree with me? Or have some more universal truths? Leave me a comment and we can discuss it in length. "What to cook next week?" is a regular question I ask myself and the people around me every weekend so I can stock up on the raw material. And pretty much every woman I ask, asks me back the same question. Sigh. And the second point takes me back almost 15 years in time when I was still living with my parents and had recently discovered I love to cook. I'd flip through the magazines at the library and find some new recipe and rush home to try it. And my mom had just the same response my friend's mom had - Learn to cook basic everyday food and then learn the "Specials". The wisdom in those words dawned on me much later in life when I moved to Bangalore for a job and had to eat out everyday. I craved for simple home cooked meals like my mom made. So now I balance my simple meals with my special meals. And sometimes, I mix the two. This Avarekalu Uppit is my version of special and simple, all combined together. Avarekalu or Hyacinth beans are extremely seasonal and make their appearance for a short time in the winter. Imagine my surprise when I found street vendors selling it at this time of the year. I had to pick them up. Addition of avarekalu made my simple uppit, special for me. Avarekalu is a local name for Hyacinth beans. They have a very subtle delicate flavor. In winter, there is a fest dedicated just for Avarekalu in Bangalore where the creativity of the chefs is displayed as they make anything and everything using avarekalu. Ah! Simple special moments in life!!! Uppit or Upma is a dish usually had for breakfast in South India. It is made my cooking toasted semolina or rava in a vegetable broth. You can make uppit with just onions and tomatoes or load it up with veggies like carrots, peas, green beans, cabbage, capsicum or like in this recipe - Avarekalu. To make a simple Avarekalu Uppit, you can skip all the other vegetables except the avarekalu, onion and the tomato. You may also like to check out the recipes for Uppit/Upma or Avarekalu Saaru. In a kadhai or pan, toast the rava for 4-5 minutes on low heat until fragrant. Chop the onion, beans, carrot, potato, tomato and the chillies. Heat oil in a kadhai and add the mustard seeds. Once they splutter, add the curry leaves. Immediately add the onions and green chillies and fry until the onions are translucent. Add the other vegetables along with the avarekalu to the kadhai and stir for 1-2 minutes. Add the water and cover and cook until the avarekalu and the beans are cooked. Add the rava while stirring continuously to avoid forming lumps. Cover and cook on low heat for 3-4 minutes. Turn off the heat and allow the uppit to rest for another 5 minutes. Now add the lemon juice and garnish with coriander and coconut and mix well. Continuing with my Instant recipes with this Instant Ragi Dosa. It is an instant dosa or crepe made with rava or semolina and ragi flour (finger millet flour). As much as I love Bangalore, I also love getting out of Bangalore once in a while. There are but only a few roads that lead out. One of them is the Mysore road. I'm not too fond of the Bangalore-Mysore highway. Too many speed breakers and way too many vehicles. Barely feels like you have left Bangalore. But it has some silver lining, in the form of the various eating joints all along the way. There is this Kamat restaurant on the way where I first ate the Ragi Dosa. And it was love at first bite. Crispy dosa served with some coconut chutney. I'd never imagined Ragi could taste sooo good. I'd had ragi in the form of Ragi Rotti or the Ragi Mudde, but never the Ragi Dosa. I simply loved it and when we came back, I was off to buy Ragi Flour to make it. Ragi Dosa is made exactly like the Rava Dosa, only the rice flour is replaced with ragi flour. Ragi Dosa is perfect for those mornings when you haven't planned ahead for breakfast. All you do is mix stuff together and throw them on a hot griddle or tava. Yup no spreading it with love like the regular Dosa or pancake, you have to throw it on and let it take the shape it likes. No obsessing over the round shape. It is also perfect for that 5pm hunger of mine. A great alternative to all that fried stuff around. Making awesomely crispy Ragi Dosa requires patience, something I lack, so sometimes I'm just okay with soft ones. But I have the following tips to making a great Ragi Dosa. The same work for Rava Dosa as well. Mix and make the dosa immediately. Do not leave it to soak. Soaking allows the rava or semolina to soak up all the water and it won't get crisp. The batter needs to be thin. Make a few and try, you will know if you need to add more water. The consistency should be similar to that of buttermilk. Pour the batter when the tava or the griddle is really hot and then lower the heat and leave it to crisp up. Don't skimp on the oil. The dosa needs oil to crisp up, at least 1-2 tsp per Dosa. Oil-less Ragi Dosa is just not as tasty. Spoon the mixture on a hot tava. Flip when browned. I had an INDULGENT weekend. I-N-D-U-L-G-E-N-T!!! I'm spelling out stuff, so I guess you get the picture. Spicy Biryani lunch, Cheesy Pasta for dinner, Deep fried Bread Rolls for snacks and a heavenly TRIPLE Chocolate Milkshake, I’ve had it all. And I cooked none of it. Nada. I’m sure it will take me a month to work it off. Sigh!! All those guilty pleasures made me want to eat a healthier breakfast this Monday morning. I’d never been a Rava Idli fan, regular Idli, give it to me anyday and I’ll eat it. But I wondered why would one eat that hard lump of rava (semolina) for any meal? This was until I made my own. Eye opener – Rava Idli does not have to be a hard lump. It can be soft like the regular rice Idlis. It can actually be delicious. All credit goes to Gee, my sis. Someday she got the MTR instant rava idli packet and made it and repeatedly kept telling me how good they had become. MTR is a legendary restaurant in Bangalore that actually invented the Rava Idli when there was food shortage during a war. A place you should visit for some rich South Indian food. The restaurant rocks, but I won’t accept defeat from a packet. Na-ah. 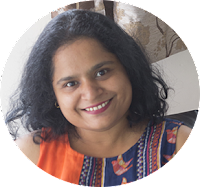 So I made just to show her that she can make equally good Rava Idlis with just the ingredients she has at home. I had no plans of liking them at all. It was just a competition with the packet, that’s IT. (I'm competitive that way). At least that’s what I thought, until I ate them. I mean if I make them, I have to taste it, right? And what a pleasant surprise it was. Soft smooth Rava Idli. And so easy to make as well. No overnight soaking, no overnight fermenting. Just mix and steam. I'm always on a lookout for breakfast recipes. And they obviously have to be HEALTHY and EASY to make. These Rava Idlis satisfy all my criteria. So they have been back on the menu time and again since that day. Toast the Rava / Semolina - You can either toast it when you decide to make the Rava Idlis or you can toast the rava whenever you have time and store it. Toasting helps increase the shelf life of rava. You can then use it instantly while making Upma too. Grate a carrot, Chop a chilli - Yup, you will need to grate a carrot and chop some chilli and coriander. Tempering - Heat a little oil, throw in some lentils (dals), mustard seeds, curry leaves and chilli. This is seriously a 10 seconds job. Mix once - Mix tempering with the rava. The rest is exactly like the packet. Mix in the ingredients. Allow it to rest for some time. Then steam them as usual. 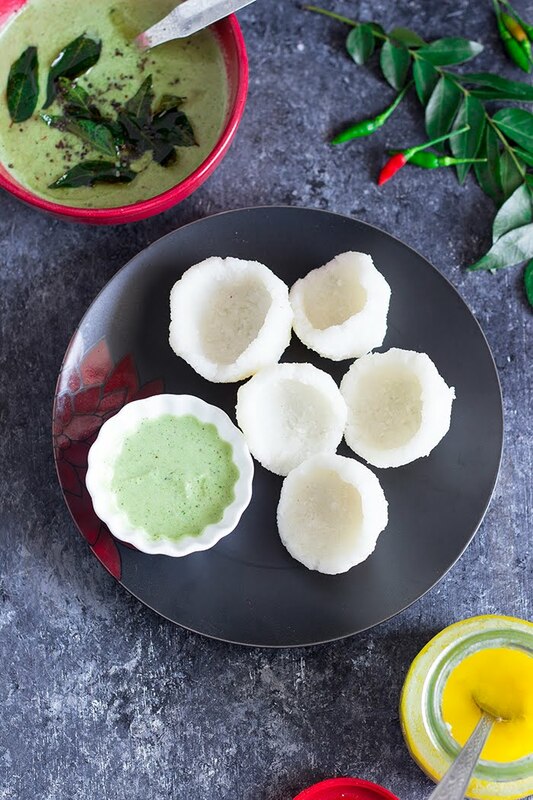 Ta-da - Instant soft smooth Rava Idli. Popular South Indian instant steamed breakfast cakes made from semolina or rava and yogurt. Toast the rava in a kadhai on low flame for 8-10 minutes. Stir frequently to avoid burning. Remove it into a large bowl once done. Heat oil in the kadhai and add mustard seeds to it. Once the mustard seeds splutter, add the urad dal and the chana dal. Once the dals brown slightly, add the curry leaves and chilli. Pour this tempering to the toasted rava. Once the rava has cooled, add grated carrot, yogurt, chopped coriander, baking soda and salt and mix well. Add water by the spoonful. The consistency of the batter should be similar to the regular idli batter. Leave aside for 10-15 minutes. In the meanwhile, prepare the idli steamer. The water in the steamer should be boiling when we put in the idli, else the idli will become hard. Now grease the idli mould, and pour in the batter. Serve hot with chutney or sagu. Cucumber Dhokla is a savory steamed chickpea flour and semolina cake with added cucumber that is perfect for breakfast or as a tea time healthy snack. I've been missing around the blog for 2 weeks now. I've been busy cooking up an amazing spread that will soon appear here. Now that's what I would love to say. But that's not what I have been doing. Everyone at home has been under the weather and what I have been cooking has been just soup and regular dal rice. and my taste buds totally ditched me too. I could barely make out what the food tasted like. I can finally taste the food and I'm SOO happy about it. I've recently gotten obsessed with one particular fruit and one particular vegetable - the water melon and the cucumber. And today is all about the Cucumber. I've been adding cucumber to almost everything - Upma, Akki Rotti, Sambar etc. What I love about adding Cucumber to any dish is that it ends up giving it that moistness along with a very subtle flavor. That is exactly what it did to this Dhokla. Cucumber Dhokla is my own concoction that is inspired from the traditional Dhokla. I recently had a cucumber pakoda (Seriously!!!) and it tasted good (Really!). I never would have guessed that cucumber that besan (chickpea flour or gram flour) would go so well together. So when I set out to make dhokla this time, I got a little creative, I added in a grated cucumber and a bit more. I also added in a little bit of grated carrot, a few frozen peas, and finely chopped capsicum. Although technically, I should be calling it a mix vegetable Dhokla. I prefer calling it the Cucumber Dhokla, cause that flavor it had in the end was all fresh Cucumber. You can skip the remaining vegetables and just stick to the cucumber and it will taste just as good - I promise. Instant Cucumber Dhokla is a savory steamed chickpea flour and semolina cake with added cucumber that is perfect for breakfast or as a tea time healthy snack. 1. You can steam in an Idli steamer or a pressure cooker or a large deep saucepan. If using a pressure cooker, remove the whistle. 2. Pour around 2-3 cups of water in it and cover it and allow the water to come to a boil. 3. Place a small upturned flat bottomed bowl or vessel at the bottom of the steamer. 4. Mix together all the ingredients except the water, oil and the fruit salt. 5. Add 3/4 cup of water and mix well. Add more water if required. The dough should be thick yet pourable. Almost like a cake or idli batter. The quantity of water depends on the type of rava and besan. 6. Once your steamer is ready, grease a flat vessel that will fit into your steamer with oil. 7. Now add the fruit salt and the remaining water and mix well. The fruit salt should cause the batter to start foaming and become light. 8. Pour the batter into the greased vessel and place it in the steamer. 9. Allow it to steam for 10-15 minutes. Depending on the depth of your vessel, you may need to keep it in longer. The Cucumber Dhokla is ready when a skewer or knife comes out clean. 10. Allow it to cook and remove from the vessel. 11. Heat oil in a pan and add the mustard seeds. 12. Once the seeds splutter, add the curry leaves. 13. Remove it off the heat and add the sugar and the lemon juice. 14. Cut into bite sized pieces. 15. Pour the tempering over the Cucumber Dhokla. 16. Garnish with the coconut and the coriander. 17. Serve warm with coriander chutney or sweet and spicy yogurt.